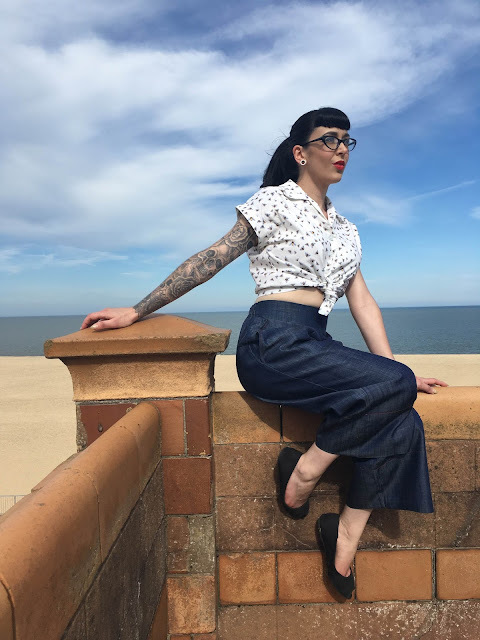 Little Miss Doo Wop | Pin up, rockabilly and vintage fashion and lifestyle blog: Denim Culottes and Bumble Bee Tops! Fun at the seaside with Weekend Doll. Denim Culottes and Bumble Bee Tops! Fun at the seaside with Weekend Doll. So this weekend we had our dear friends Carl, Jen and their adorable son Ethan over to stay. So, we made the most of living in a Seaside town and took them to Great Yarmouth Pleasure Beach! Carl is a fantastic photographer, so I made no excuses for using his talents completely to my advantage and we took a few snaps for the Weekend Doll blog. 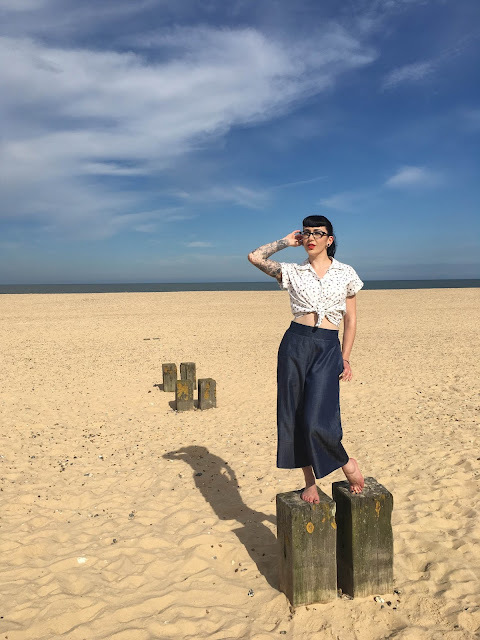 We headed first to Great Yarmouth, where I wore the DenimCulottes. In terms of style, I would not normally go for a culotte, as in all honesty, I have not worn a pair since school! But I was pleasantly surprised at how much of a nautical pinup look they gave (I’m a sucker for anchors as well as polka dots!). 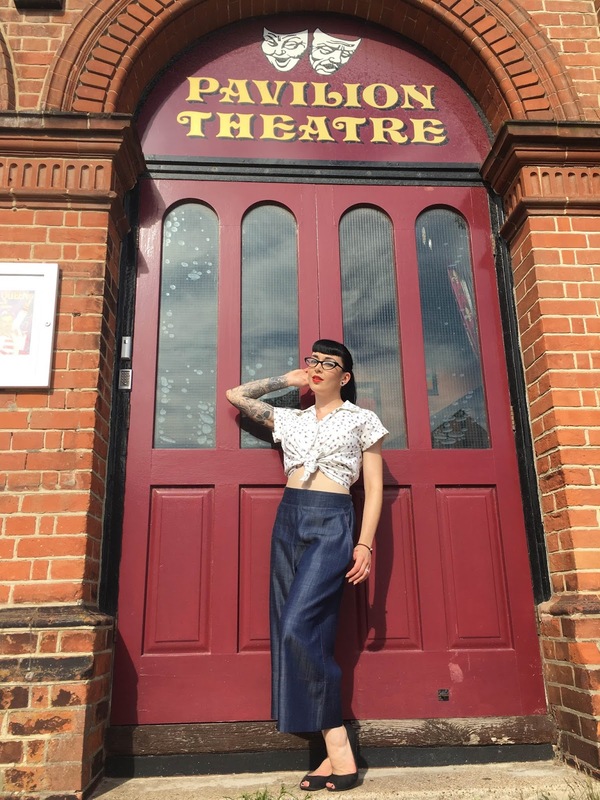 The culottes have pockets which is an instant plus point, as well as an elasticated waist, meaning they were super comfy! They are made of Lyocell, which is a super lightweight, rayon type fabric, so I was perfectly cool on one of the hottest days we’ve had this year. In terms of fit, I am 5ft 2in, so I was under absolutely no illusions regarding the length that these would be on me. The length was a tad on the long side, but being short, this is something that I am no stranger to. I wore the XS which is a Size 8. This translates to Waist = 25in and Hips = 34in. I have a 26.5inch waist and 34inch hips, so I would say that the culottes come up slightly large as I could have done with a bit less room in the waist, especially as they are elasticated. I would therefore recommend sizing down for this item. The quality was perfect and I especially liked the red stitching detail on these. My husband and I then headed to Gorleston Beach for an evening stroll. 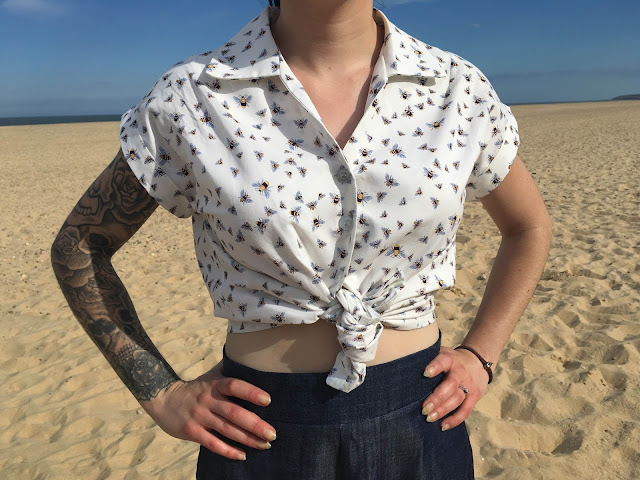 I wore the denim culottes with the Bee Shirt. This shirt is cut for a slightly loose fit, so for a more fitted look, you should size down. I didn’t do this, as I am quite broad. Plus, this shirt is not designed as a cropped shirt. It is a standard length shirt, but it has been styled as a crop. Therefore, I decided to stick with my normal size for a bit of extra room. I am a 35inch bust and wore the shirt in a Size 8 – XS. This is described as a 32 inch bust top. So I would definitely suggest sizing down if you want a tighter fit. I think in hindsight, I could have worn a smaller size, but I was perfectly comfortable in the 8. Again, quality was perfect on this shirt and I liked that it was versatile enough to wear long or cropped. It was a very hot weekend, but I was perfectly cool in the whole outfit and felt extremely comfortable; it was a welcome change to being trussed up in a wiggle dress or a high waisted belt!